I read a really interesting critique of the idea of accelerated change this week. Actually, it was a rather appreciative review of someone else’s critique. But it contained enough information to compel me. It made me question a belief I had largely taken for granted. The belief that the period we live in now is seeing more rapid change than ever before, and that the rate of change continues to accelerate. Having considered it for a few days, the conclusion I came to is that the world really is changing faster now. But we have to qualify that statement carefully. If you’ll forgive my engineer’s brain, I want to try to do that using the language of waves. The criticism of the theory is based on the idea that changes of greater magnitude happened in previous eras. Robert J. Gordon focuses on the period from 1870 to 1970 (‘the second industrial revolution’) when advances in transport and domestic appliances transformed people’s lives. There were drastic improvements in mortality rates, and falls in the time taken to keep a household clean and fed. And much less horse manure on the streets. It is impossible to ignore the magnitude of these changes. Has the impact of widespread internet access and the computer (in all its forms) been as great as the impact of the car? It’s hard to say without the benefit of historical perspective, and because perhaps we don’t yet know what will be the most important metric by which to measure the impact of these things. But to try to argue that the computer is more important than the car is to miss the point. Here comes the science bit: it is to confuse amplitude and frequency. Amplitude and frequency are two of the characteristics of waves. Amplitude is how far the wave moves up and down from the baseline: how much does it change. Frequency is the speed with which it does so: how many times does it change in a given period. The amplitude of changes like the advent of the washing machine is clearly very great. 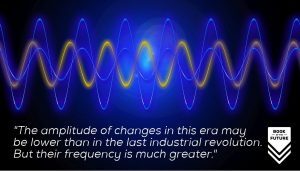 But the change happens slowly: the frequency is low. It takes a long time for such a product to be developed. For that design to iterate. For the public to adopt it. Today, whatever the amplitude of the change, the frequency is much higher. We create, iterate, adopt and abandon new ideas and products at a much greater rate than at any point in history. We can see this in adoption curves for modern products versus those such as the washing machine: our hyper-connected societies spread these ideas much more quickly now. We can see it in the turnover of the stock markets: innovators displace incumbents faster than ever before. Whether the impact of the computer proves to be greater than the car or not, only history will tell. But it’s an impact that happened faster. And when the next major world-changing innovation happens, that will change the world faster than its predecessors as well, however great the amplitude of that change.